The ‘80s gave women a bona fide guitar hero in the form of Jennifer Batten, whose sharp skills kept her in hot demand supporting pop and rock stars on stage and in the studio for nearly two decades. 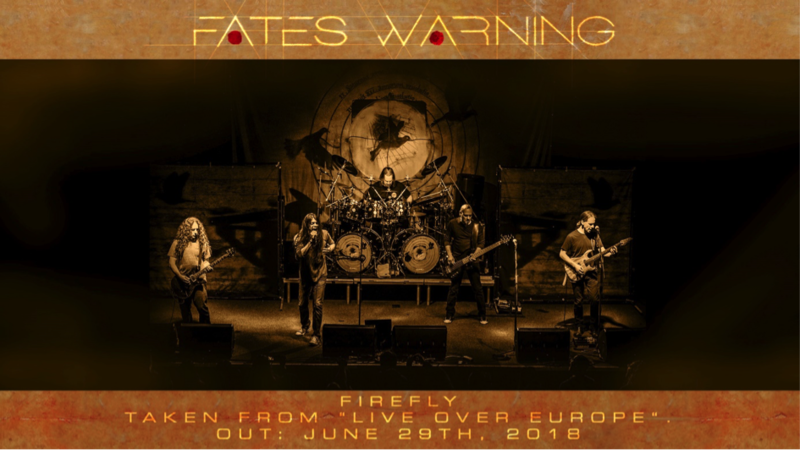 The ‘00s brought us Orianthi, and the ‘10s… the new High Priestess of Rock honor goes to Nita Strauss, who first gained attention in The Iron Maidens, a renowned, all-female, Iron Maiden tribute band. Strauss then stepped into the arena spotlight when she replaced Orianthi as guitarist for hard rock legend, Alice Cooper (Orianthi had left the band to tour with Michael Jackson). And if that’s not enough street cred for you, consider that she’s actually a descendent of legendary Austrian composer, Johann Strauss II. It seems fitting that this 31 years old shredder, who has been playing Ibanez guitars for years, would become the first female Ibanez artist to earn her own production model signature guitar. She’s got a good head for what makes a great rock guitar, as the JIVA10 is based on the S-series, a longtime favorite of fusion- and rock-minded players ever since Frank Gambale popularized the line with Chick Corea’s Elektric Band when Nita was just a toddler. This is a no-fuss guitar with sleek lines, lightweight, solid hardware appointments, and a comfortable neck. Read on to discover whether or not the JIVA10 has been imbued with a life force of its own. The Ibanez JIVA10 is a gorgeous instrument to behold, with a very subtle green hue to the guitar’s Deep Space Blonde finish, and the slightly translucent application lets the grain show through. Ibanez S-series bodies are thin, sculpted affairs, and this one features a quilted maple top on a solid mahogany body with nice binding details around the top edges. Many players love them for the combination of mahogany tonewood with a lightweight body thanks to the way the guitar thins out around the central tone block. This guitar weighs in at just under seven pounds. The JIVA10 features a familiar HSH pickup configuration, in this case loaded up with three direct-mounted DiMarzio pickups: Nita’s signature Pandemonium humbucker in the bridge, True Velvet single coil in the middle, and another Pandemonium in the neck. Each of the pickups are passive, with ceramic magnets in the Pandemonium pickups and an alnico magnet in the True Velvet. A standard Ibanez five-way blade switch provides the usual combinations, and there are one Volume and one Tone control. 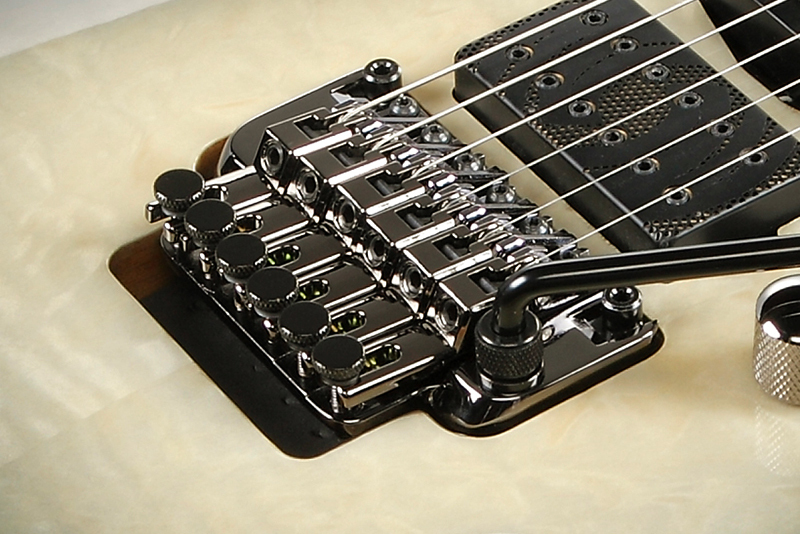 The double-locking tremolo system is an Ibanez Edge-Zero II. It features a pop-in arm with thumbscrew locking collar for easy arm placement (fixed or swinging freely), but this system lacks the ZPS3 Zero Point System that many previous Ibanez models included (and is now notably absent among models in the 2018 lineup). The JIVA neck is a three-piece neck cut from maple and purpleheart, with an ebony fretboard that feature’s Nita’s “Beaten Path” inlay. It reminds us of electrical impulses or heartbeats on a monitor, fitting given that according to Hinduism, a jiva is any “entity imbued with a life force.” Not as thin as a Wizard neck, this 25.5” scale neck is 43mm wide at the nut and 58mm wide at the 24th fret, with a 400mm (15.75 inch) radius. Given the slightly greater mass of this neck, there is no wood bump out for reinforcement at the break point just beyond the fretboard as found on Wizard necks. 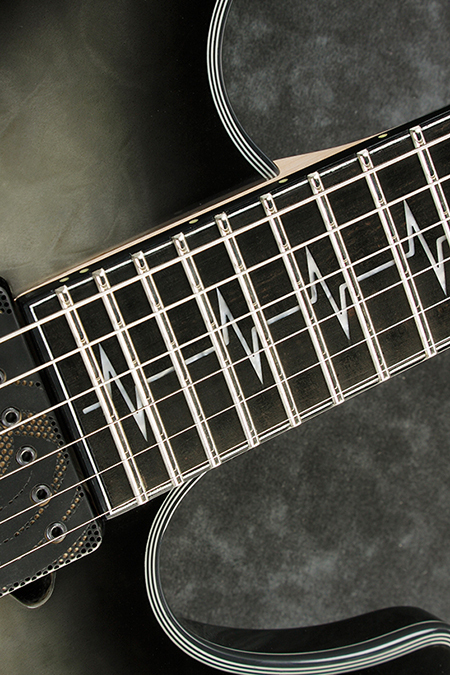 The JIVA neck has jumbo frets and luminescent dot markers along the top edge of the fretboard. The Indonesian-manufactured guitar feels similar in build quality to other Ibanez Premium-series instruments we have previously reviewed, like the RG1070PBZ and JEM77P. The combination of light weight, thin (but not too thin) neck, and .009-gauge strings make the JIVA10 a supremely comfortable guitar on which to shred happily for hours or days. Unlike the other Ibanez guitars mentioned above that each had super-thin, Wizard-series necks, the slightly beefier neck of the JIVA10 will appeal to rock players who like to shred but prefer a little more mass to their necks. The matte neck finish was always smooth to the touch and never sticky. The fretboard has a typical Ibanez flatness to it, which combined with the jumbo frets made tapping and string bends a piece of cake. And, the Edge-Zero II tremo (same one found on the JEM77P) was a joy to use. 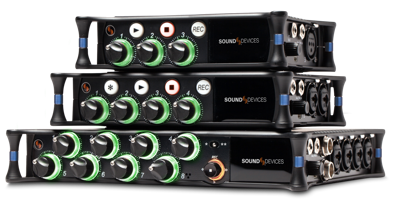 The lack of a ZPS3 system—which is great for achieving perfect return-to-zero bridge positioning after all bends—actually makes for better overall use when creating intentional tremolo effects. We had no issues with tuning stability, which is to be expected as Ibanez double-locking tremolos are renowned for their tuning stability. The Volume and Tone knobs, and blade switch, all performed as expected, with an easy resistance suitable to classic pinky swells should the need arise. 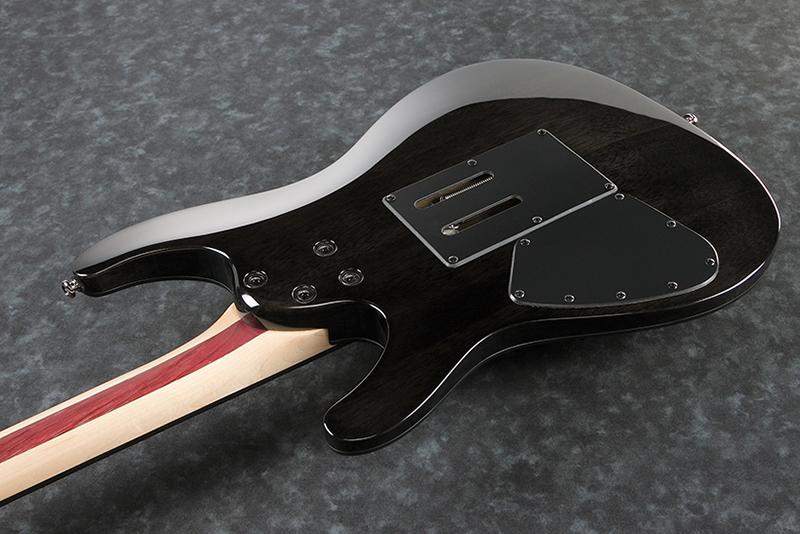 S-series bodies are well balanced, and the thin, sculpted body was comfortable to play for hours on end. We had a lot of fun playing the Ibanez JIVA10 through a few different amps including and ENGL Powerball II, Hughes & Kettner Grandmeister Deluxe 40, and a Laney Ironheart. The JIVA10 is full of mostly familiar S-series tone thanks to the solid mahogany body and compliment of DiMarzio pickups, which is sure to make a lot of players happy, regardless of your desire to play Iron Maiden or Alice Cooper favorites. Older Ibanez players like us grew up with the S-series guitars, starting out with DiMarzio-designed, IBZ-branded pickups, and we spent years swapping out pickups, an old favorite for the S-series being the DiMarzio Tone Zone. But if that’s the sound you think of when it comes to the S-series, watch out, because Nita’s signature pickups are significantly hotter and metal-minded than the older options. Focusing on the clean tones first, this is one fantastic, spanky sounding guitar! S-series guitars always delivered bright, funky tones, and the JIVA10 upholds that tradition in the split pickup positions 2 and 4. 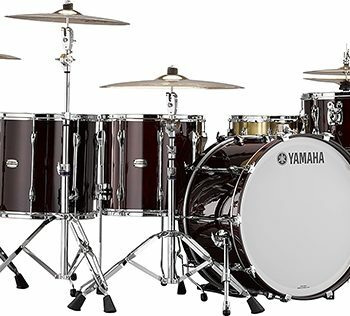 If you’re playing in a cover band that covers any classic disco, you’ll love the ultra-clean, bright, and woody tone. When you kick in the high gain, you’ll discover that Nita’s signature Pandemonium pickups are extremely hot—so hot so that we flipped the guitar over looking for a battery compartment, assuming these might be active. They top out just below driving your amp’s clean channel into breakup, though, and they have a more pronounced midrange bump than other pickups you’d commonly find in S- or RG-series guitars such as the DiMarzio Crunch Lab, D Sonic, Steve’s Special, or Tone Zone. The Pandemonium bridge pickup has hotter output than all of the above. If you’re into whammy bar antics and tapping out some harmonics, the bridge Pandemonium pickup in particular lives up to its name. It is easily excitable, and you’ll be melting faces in no time while shredding on this hot-rodded Ibanez. Classic rock players, though, may find these pickups a bit too excitable and slightly harsh. The DiMarzio True Velvet single-coil pickup is a popular middle-position choice, and it is this pickup’s thin bass response and bright high end that make it a perfect complement to the bridge and neck pickups for getting those fantastic in-between sounds. 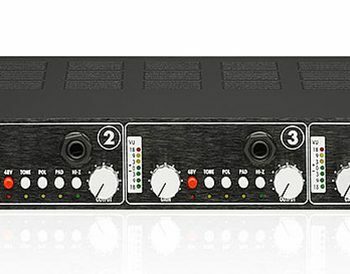 On its own, the pickup exhibits a typical amount of single-coil hum, but that is completely canceled in positions 2 and 4. For players who like to solo on the neck position pickup, the neck Pandemonium pickup has less output than the bridge model, and a smoother response, but we’d have to stop short of calling its tone creamy or liquid. Pandemonium is clearly made for high gain rock and metal, and if you live to shred, the aggressive nature of these pickups will suit your playing just fine. But for more classic hard rock and metal tones, we would consider swapping them out for slightly lower-output DiMarzios. It would be worth the effort with this guitar because everything else about the JIVA10 is ideal for rock musicians in need of a fast playing yet comfortable, and otherwise versatile guitar. Ibanez includes a multi-language instruction manual that provides details regarding care and maintenance, adjusting the tremolo unit, and changing strings. 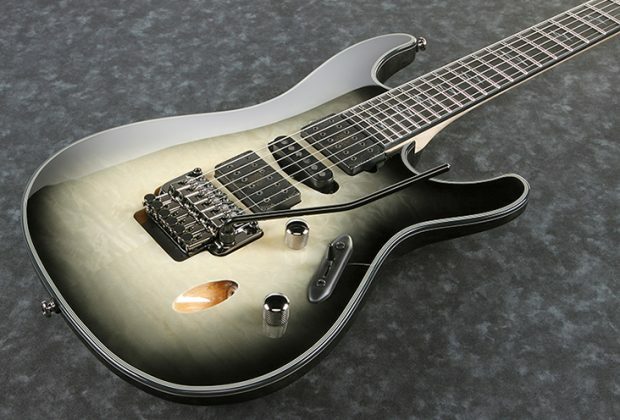 The Ibanez website is full of helpful videos and detailed product information, too. 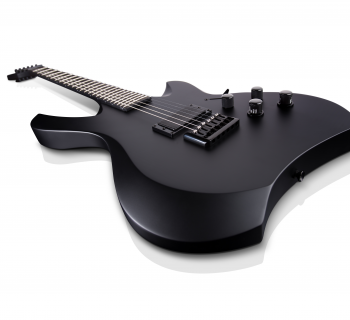 The Ibanez JIVA10 Nita Strauss signature guitar (MSRP $1,999) sells for approximately $1,500. Whether the pickups suit your style or not, it’s a fantastic playing guitar full of very good sounds, a slightly thicker neck than you find on high-end Ibanez S-series guitars, and the signature fretboard inlays and paint job definitely give it a special vibe all its own.